June 30, 2012 may go down as the biggest upset in All American Pro Wrestling history. 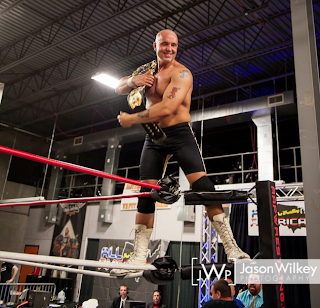 At the first ever Summer Chaos event, "The Masterpiece" Mike Masters became the AAPW heavyweight champion. And the win may be the most controversial in the company's history as well. Masters won the title after locking champ Edmund "Livewire" McGuire in a painful submission hold. Ed struggled to make it to the ropes, but couldn't get there. AAPW owner Sean Chambers was in Livewire's corner, and decided to throw in the champ's towel to end the match and presumably protect the McGuire from further injury. But here's the thing, Livewire never tapped out, so understandably, he's upset. Masters, a crafty veteran, immediately grabbed the title and began gloating over the win. He's even created a Facebook fan page. Masters has done a 180 in the ring since last season of AAPW Collison. He was on a losing streak of sorts throughout season one, blaming it on me after I whacked him with a chair during an interview at the TV station I work for. Masters and I actually had a match back in January, in which I scored the pinfall (thanks to a Jay Spade chairshot). It may be that chairshot that woke Masters up though as he returned for Season 2 of Collision he was more focused and determined to win. That combination helped him picked up a huge victory on the season premiere, winning a number one contenders battle royal. He was then granted a title match, and unlike past efforts in the ring, he hung with McGuire, eventually getting pinned. However, his foot was on the bottom rope. The referee just didn't see it. Masters demanded a rematch, but the champ moved on to other competition in AAPW. It was during a title defense against Jeremy Wyatt that we saw just how sadistic Mike Masters can be. He attempted to attack Livewire, who knocked him off the ring apron. Masters, already flustered, was distracted by a fan who had been taunting him all night. That's when Masters snapped and punched the young man in the face, dropping him to the floor. AAPW Executive Producer immediately fired Masters for his actions, but that decision was quickly overturned by Chambers, who reinstated the villain and granted him his rematch with McGuire. But there was a caveat. Masters had to win the match or Hagstrom's original firing would stand. The match was also made into a no disqualification affair. I had the pleasure of calling the action, and it was an intense battle. The two hit each other with everything from a motorcycle tire (we tape in at Black Diamond Harley Davidson's warehouse), to a metal garbage can, and even that infamous chair that was used against Masters in January. As soon as the bell sounded to end the match, fans and AAPW officials were overcome with emotion. I saw children crying in the audience. Their hero was robbed of the championship. 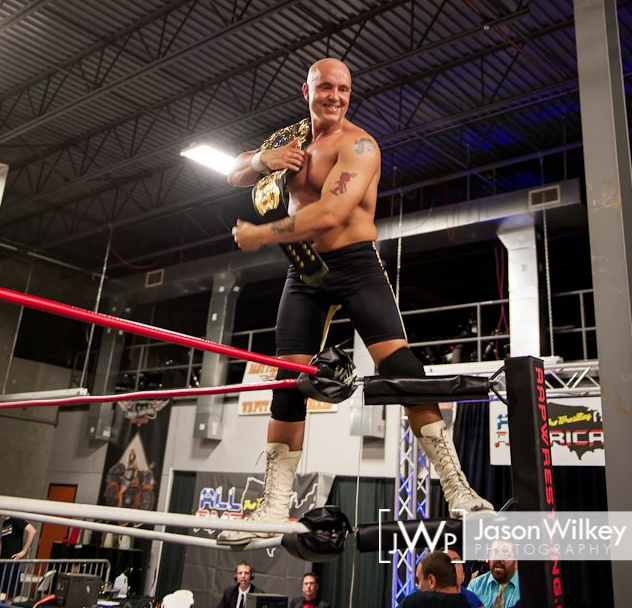 The company's biggest bully is now representing AAPW as its champion. The big question now is what's next for AAPW? No doubt some of those questions will get answered on Saturday, July 21 at the next Collision taping. Join us at the Black Diamond Harley Davidson Warehouse in Marion, Illinois. Bell time is 7 p.m. Keep up to date with AAPW on it's YouTube channel as well.